On Monday we organised the eighth Scrambling for Safety conference to help inform debate about the implementation of the Regulation of Investigatory Powers Act. There was press coverage by the BBC and silicon.com; you can find the speakers’ slides here. (Video of the talks should appear in due course.) The aim was to help people respond to Home Office consultations on access to keys and on communications data. AOL has recently been embarrassed after it released data on the searches performed by 658,000 subscribers. Their names had been replaced by numbers, but this was not enough to stop personal information leaking. The AOL folks just didn’t understand that protecting data using de-identification is hard. They are not alone. An NHS document obtained under the Freedom of Information Act describes how officials are building a “Secondary Uses Service” which will contain large amounts of personal health information harvested from hospital and other records. It’s proposed that ever-larger numbers of people will have access to this information as it is progressively de-identified. It seems that officials are just beginning to realise how difficult it will be to protect patient privacy — especially as your deidentified medical record will generally have your postcode. There are only a few houses at each postcode; knowing that, plus a patient’s age, usually tells you whose record it is. The NHS proposes to set up an “Information Governance Board” to think about the problem. Meanwhile, system development steams ahead. Clearly, the uses and limitations of anonymisation ought to be more widely understood. There’s more on the subject at the American Statistical Association website, on my web page and in chapter 8 of my book. The National Consumer Council has published a report on “identity fraud” which is rather regrettable. Identity fraud is not fraud, from the consumer’s viewpoint. If someone pretends to be me, borrows 10K from the Derbyshire Building Society and vanishes, it’s the building society that’s the victim, not me. If Experian then says I’m a loan defaulter when I’m not, that’s libel. Suing for libel may be expensive, but the Information Commissioner has announced his willingness to issue enforcement notices against the credit agencies in such circumstances. The NCC should have advertised this fact and encouraged people to go to him. “Identity fraud” is an objectionable concept, an attempt by the banks to dump some liability. The Home Office egg them on because they think that rebadging credit-card fraud as “identity fraud” will help sell identity cards. But it’s a bad show when consumer organisations collude with an attempt to make consumers the victims of bankers’ and credit reference agencies’ negligence. “Security theater” is the term that Bruce Schneier uses to describe systems that look very exciting and dramatic (and make people feel better) but entirely miss the point in delivering any actual real world security. The world is full of systems like this and since 9/11 they’ve been multiplying. Bruce also recently ran a competition for a “movie plot” security threat — the winner described an operation to fly planes laden with explosives into Grand Coulee Dam. As it happens, I was recently actually at Grand Coulee Dam as a tourist — one of the many places I visited as I filled in the time between the SRUTI and CEAS academic conferences. Because this is a Federal site, provision was made from the beginning for visitors to see how their tax dollars were spent, and you can go on tours of the “3rd Power House” (an extra part of the dam, added between 1966 and 1974, and housing six of the largest hydroelectric generators ever made). Until 9/11 you could park on top of the dam itself and wander around on a self-guided tour. Now, since the site is of such immense economic significance, you have to park outside the site and go on guided tours, of limited capacity. You walk in for about 800 yards (a big deal for Americans I understand) and must then go through an airport style metal detector. 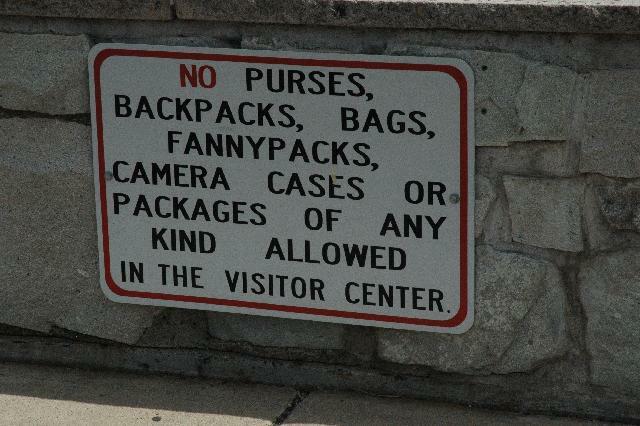 You are not allowed to take in backpacks or pointy things — you can however keep your shoes on. The tour is very interesting and I recommend it. You get to appreciate the huge scale of the place, the tiny looking blue generators are 33 feet across!, and you go up close to one of the generators as it spins in front of you, powering most of the NorthWest and a fair bit of California as well. The security measures make some sense; although doubtless the place the bad guys would really like to damage is the control center and that isn’t on the tour. However…. … on the other side of the valley, a quarter of a mile from the dam itself, is a “visitor arrival center“. This contains a number of displays about the history of the dam and its construction, and if you have the time, there’s films to watch as well. On summer nights they project a massive laser light show from there (a little tacky in places, but they run white water over the dam to project onto, which is deeply impressive). You don’t have to go through any security screening to get into the center. However, and that’s the security theater I promised — you cannot take in any camera bags, backpacks etc! What’s the threat here? I went to a dozen other visitor centers (in National Parks such as Yellowstone, Grand Teton, Glacier, Mt. Rainier and Crater Lake) that were generally far more busy than this one. Terrorists don’t usually blow up museums, and if, deity forbid, they blew up this one, it’s only the laser lights that would go out.